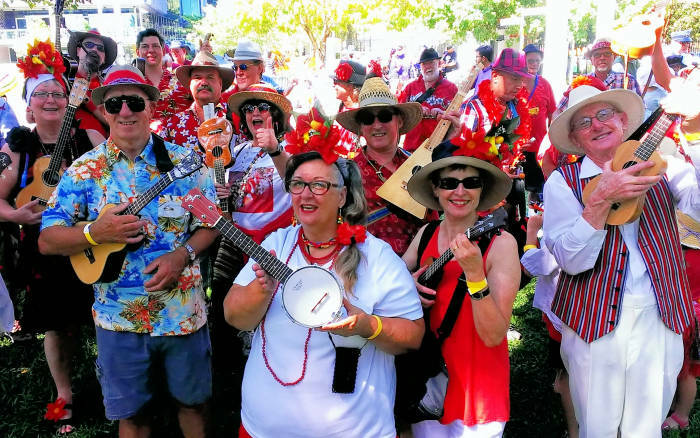 We are a bunch of people (in Brisbane, Queensland, Australia) who enjoy the fun and camaraderie associated with making music with ukes. Nothing more complicated than that. Our secret mission is to change the world one uke at a time . . .
SPRUKE 2019 will be held over the weekend of 13 — 15 September We have a new festival precinct at Sunnybank Performing Arts Complex — SunPAC. SunPAC is located next door to the Sunnybank Community and Sports Club, 470 McCullough Street, Sunnybank 4109. Our intention is to provide new opportunities for ukulele musicians to engage with music, each other, luthiers (uke-makers) and similar creative folk together from all over Australia. We aren’t just bringing people to town, we are also working with people and local businesses in the area. We are providing opportunities for students from TAFE to get real life experience in their field of study. The festival theme is Uke’n Make Music! The purpose of the festival is to bring together ukulele clubs, players, makers, teachers and anyone interested in learning to play ukulele to create a weekend of entertainment, active participation and learning new skills and sharing a love of music through this instrument. Our further aim is to engage the non-ukulele-playing public and to introduce them to the music, the joy and the camaraderie that this little instrument can bring. There will be a variety of activities and entertainment for all levels of ukulele player, to be educated and inspired. We hope that the experiences we have to offer at the festival will lead to a continuing journey in music and the ukulele, long after the festival has ended.